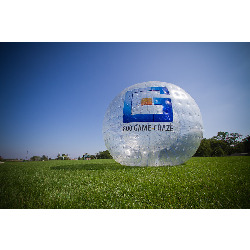 Climb in one of our huge ten foot spheres and run, jump and spin your way to a great party. Giant human hamster ball parties are a fun, family friendly and affordable activity. Hamster balls can be done almost anywhere there is an open, level grassy area such as a park* or back yard. Indoor parties can be done at a school or recreation room.